I recently shared a picture on my Instagram about my prize box. I received quite a few questions about it, so I thought I would share more here! First let me say, that I have not always been a prize box teacher. I would start off strong with rewarding "something" whether is was good effort, reading growth, or a 'wow' moment, but I never had the follow through. I certainly was not promoting any good behaviors or growth in my students with my lack of consistency. Once I realized this was the kind of teacher I was, I moved away from the prize box. And that's OK! You have to do what is right for you! Your students are not going to think less of you because you do not have a prize box. You can think of others ways to praise good behavior, strengthen positive attitudes, develop growth mindset or celebrate goals, and your students will appreciate them just the same. So, why did I jump back on the prize box bandwagon? How could I, the new girl, be the only one who didn't use a prize box? For example, we can have 16-20 second graders in our room at one time, and how can my 5 be the only ones NOT getting to go to the prize box? I had to find a way to make rewards work. And so, the Prize Box was born (again, but better)! My students were motivated because they loved getting books that they could take home and keep forever. I was motivated because, what teacher doesn't like giving out books and seeing their students read them. This was a prize that I could actually commit to! How does the Prize Book Box work? My students K-2 have "homework". 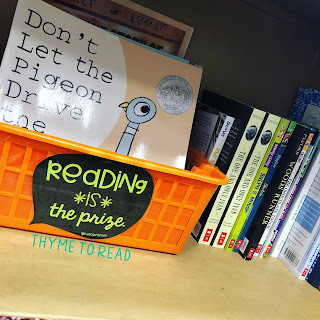 Each week, I put a sight word review sheet and a book to read (usually it is a re-read of a book we read in group the week before). My first and second graders also have a reading response question they are responsible for. It isn't a lot of homework, but it is purposeful and encourages my struggling readers to read at home. If they are making progress on their homework each night, they earn a point on Class Dojo. When they have 25 points (or 5 weeks of doing homework), they earn a book. A real book that they can keep FOREVER! My 3-5 graders earn books a little differently. They do not have assigned reading homework from me, but they do have assigned reading from their classroom teacher. I piggy back on this, and offer them a some reading challenges/reading menu to encourage them to read different books. 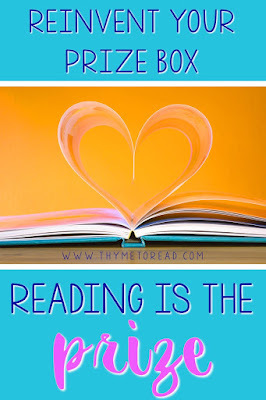 As they complete these challenges, they earn a book from the prize box. Primarily, I order the books from the Scholastic book flyers. I only order the $1.00 books. There is a wide range and they are appropriate for all of my students. I try to replenish the number of books that were taken from the prize box, plus one or two to keep a variety of choices available. But, I do what I can afford. It does come out of my own pocket, and that is my own choice. I'm sure if I asked to have money put away for the prize box, it wouldn't be a problem because I do not spend my budget money on stickers or other trinkets. I started my prize box collection at a garage sale. You can easily find gently used books at garage sales for CHEAP! If you are lucky, and you happen to mention you are a teacher, sometimes they are nice enough to just give you a bag to fill up. It has happened. Similarly, check consignment sales. My area has a few each year at an indoor sports facility. It is mostly clothes, and baby gear, but they have a nice selection of gently used books. You do not get the "teacher discount" here, but you can still get a big bang for your buck. I just found out the next sale is opening early for TEACHERS! If you find a consignment sale, it can't hurt to ask if you can come in early just to shop the books. And, don't forget to check your local library. They may occasionally have book sales too. This is great because the money you spend on books from the library sale will go back to the library so they can buy new books to fill their shelves with. And that is a win-win-win for everyone involved! Do you have more ideas on where to get books for cheap? Please share them below in the comments so we can all check them out! Do your students think they are missing out? I was asked if my students feel like they are missing out because they do not get a toy or a little notepad or a fancy pencil. And my answer was ABSOLUTELY NOT! My students brag about their new books, and the other students wide eye stare with excitement. Is there jealousy? I don't think so. My students wide eye stare at the toy cars and fancy pencils too. But no one complains about the prizes they have been given. I know my students appreciate the hand written note of praise that accompanies their book (and the parents do too). And all I can hope is that the excitement of the prize book lasts a little longer than the excitement of the toy car. I do want to add that I put my prize box on a bit of a pedestal. Much like you wouldn't let your students play with the toys in your prize box, my students cannot free read the books in my prize box. They are the most special books in the room! It helps to keep the appreciation of the prize box alive. If they were able to read them anytime, then what would they be working toward? How do I feel about the prize box now? I'm loving my prize box! It took some time to figure out what worked for me, but I am excited when I can gift a new book to one of my students. I have finally matched the behaviors and habits I am trying to develop in my students, with the excitement of the reward. I am REWARDING READING, WITH READING! Start small. You can praise the small moments, and reward the bigger milestones. 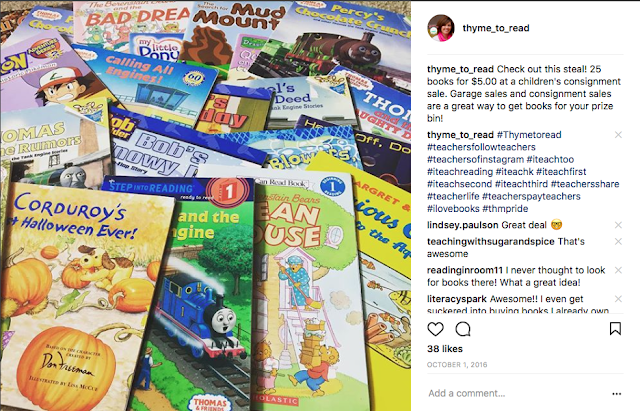 Check garage, consignment, and library sales and/or Scholastic Dollar Books to build your "inventory"
Reward the behavior with something that reflects the behavior. Reward reading with reading, because READING IS THE PRIZE! 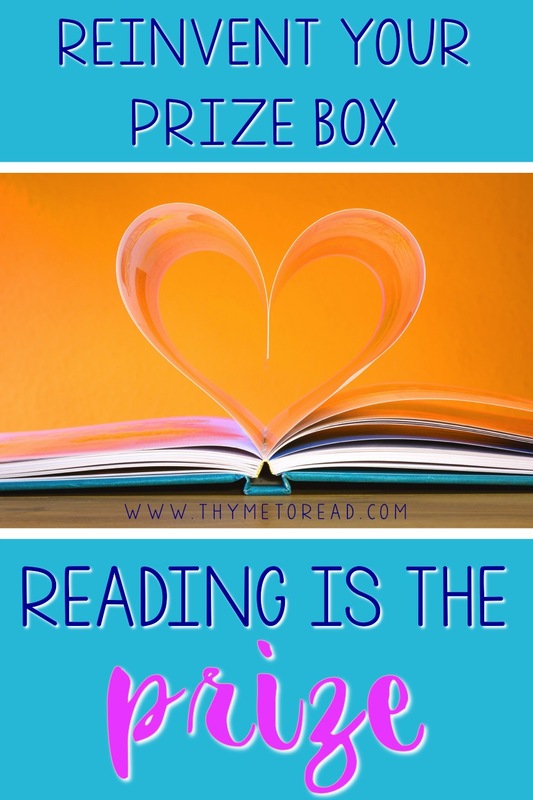 So do you use a prize box in your classroom? How do you make it work for you?